Often seen as a slightly 'old fashioned' plant, geraniums are in fact a wonderful hardy addition to the garden. Growing well in the border, in a cottage garden setting and also happy in containers geraniums are an easy care colorful and sometime scented addition to any garden. Geraniums generally require a sunny position in a humus rich soil, although some species of geranium such as Geranium macrorrhizum and Geranium aristatum do well in part shade. Available for sale from Mail Order and Online Plant Nurseries. One of the major misconceptions is that geraniums thrive on neglect, and although they do survive, for a really healthy plant and a good display of flowers a little care is required. Pruning is really the major task, and this is easy. Remove old folaige and spent flower stems to help promote a second and even third flush of flowers. As autumn come around, prune back 1/3rd (or more if needed), you can use geranium cuttings to propagate new plants. So if its a container in a sunny position on a patio, a window box or a collection in the cottage garden give geraniums a go, a little care and they will reward you with flowers from spring to autumn. Geraniums are drought tolerant long flowering and actually make great weed control plants. With flower colors ranging from white through to deep red they are also colorful. Double geraniums are very popular and some species such as Geranium plenum, Geranium oxonianum and Geranium pratense all offer a range of cultivars in double flowering forms. Geranium plenum album, violaceum and the cultivar 'diamond star' are all popular, Geranium oxonianum thurstonianum cultivars such as 'Katherine Adele' , 'Southcombe double', 'Phoebe Noble' and 'Wargrave Pink' are sought after. Geranium pratense ( Meadow Cranesbill) offers us 'hocus pocus', 'midnight reiter', 'black beauty', striatum, plenum violaceum and 'summer skies'. One of the best blue geraniums is 'Johnson's Blue' a hardy geranium that will clump up to fill a place in the garden border. This one will reach nearly 1/2m and is pictured right growing in the border next to hostas. Pictured right, photographed near Carlisle in Southern Scotland. 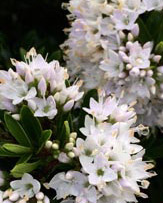 Angels and mini regals are a cross between Scented and Regals, compact, smaller foliage and flowers. Masses of flowers in summer. Fancy leaf are usually Zonal or Ivy types that have been hybridised for the leaf colour and form. 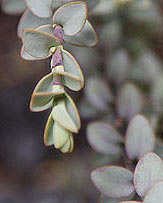 Flowers are often small, the foliage is the thing. Often harder to grow than other types these are another geranium that require filtered light to maintain leaf colour. Ivy Geraniums are also known as 'climbing geraniums' and indeed they can reach a good height with a little support to help them climb. 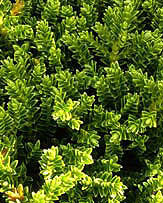 Excellent as ground cover plants and the more compact forms are widely used in hanging baskets. 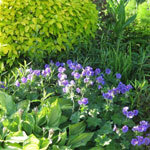 Some are Ivy geraniums are bi colour and these are best grown in light shade to prevent fading. 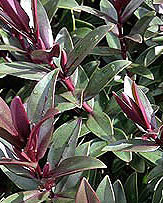 These are a vigorous type, mostly disease free and seemingly not troubled by disease or rust. Regals are the large flowered types, the flowers look a little like those of azaleas, large and frilly. They do require a cool nighttime temperature to flower 10 degrees C or less. Some growers artificially cool the root systems in winter . Includes; Regal Geraniums, Scented Geraniums, Trailing Geraniums, Zonal Geraniums and F1 GeraniumsYoung plants specialists. Open Friday - Sunday, 9.30-5.00 March to October inc.
National Plant Collection�� of Molinia hardy geranium, ornamental grasses, carex, festuca, elymus, molinia, miscanthus, panicum, pennisetum, stipa, rare plant, unusual perennials, perennial, woodland plants, shade plant, iris, achillea, polygonatum, asarum, anemone,�? disporum, disporopsis, cardamine, vinca, salvia, ophiopogon,�? epimedium, rushes, sedges, liriope. Offering a wide range of herbaceous perennials, ornamental trees,�? shrubs and old roses; includes rare varieties and species and�? well-loved classics; large plantsmans' garden.